In every sphere, nature’s ingenuity transcends human endeavour. That includes – as we’re learning from the two sets of Salisbury poisonings – deploying toxic chemicals to incapacitate or kill. Almost all manufactured forms – such as the Novichok implicated in the attempted assassination of Sergei and Yulia Skripal and the accidental poisoning of Dawn Sturgess and Charlie Rowley – work in much the same way as nature. They inhibit the action of the enzyme acetylcholinesterase, degrading the neurotransmitter acetyl choline that causes muscles to contract. As the amount of the still potent neurotransmitter accumulates at the junction between nerve and muscle, so all the body’s functions go into overdrive – twitching, sweating, vomiting, frothing at the mouth, convulsions. Finally, exhausted, the muscles can contract no more, leading to generalised paralysis – and, without medical intervention to maintain breathing, death from asphyxiation. Through aeons of time, snakes, snails, spiders, squid and a further 200,000 venomous species have exploited similar principles to immobilise their prey or defend themselves against hungry predators. Their arsenal of sophisticated chemical weaponry is, however, vastly superior to our versions, wreaking havoc in a multiplicity of different ways. 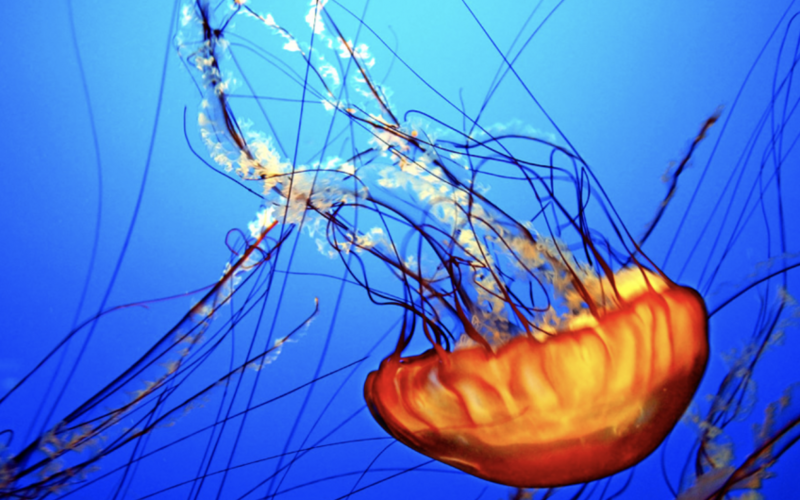 The first to do so – jellyfish, anemones and related cnidarians (as they are known) – colonised the ocean 600 million years ago. They come armed with the earliest of all venomous delivery systems: thousands of minuscule capsules, each containing a harpoon-like device, attached to a thin spring-like filament. When triggered by contact, the lid of the capsule flips open, firing, with bullet-like power and precision, the harpoon and its venomous payload deep into the tissues of its victim. We humans experience this as burning, painful, red welts. But, for creatures smaller than ourselves, their fate is sealed by an annihilating blitzkrieg of seventeen distinct forms of chemical weapons. They include enzymes that melt the connective matrix binding tissues together; four types of ‘porin’ that punch holes in the walls of blood cells, releasing a rush of heart-stopping potassium; six neurotoxins that stimulate pain fibres and impair the conduction of nerve impulses; and four further ‘bioactive compounds’ that dilate the blood vessels to cause a sharp fall in blood pressure. The mind can only boggle as to how the jellyfish acquired this arsenal, and the means of making it, all those millions of years ago. Almost more astonishingly still, numerous other venomous species coming later – scorpions, reptiles, vampire bats – acquired the ability quite independently to synthesise a similar cocktail of toxic chemicals. The pretty but deadly cone snail, whose pink, mottled shells are much prized by collectors, illustrates a further distinct feature of nature’s chemical arsenal – its synergistic action. Burrowing into the sand, the snail waits for an unsuspecting fish to swim by. The drama of what happens next can be viewed on YouTube as the snail pierces its victim with a hypodermic-needle-shaped tooth, causing instant paralysis – as if electrocuted – before swallowing it headfirst through its extensible mouth. Here, two quite separate processes are at work, with one set of toxins acting directly on the muscle to induce massive cramping spasms (the immediate immobilisation). This is followed twenty seconds later by another set that shuts down the release of acetylcholine from the nerve endings to produce a permanent, irreversible state of flaccid paralysis. The lethality of this arsenal of chemical weapons is predicated on their generalised effect, in disrupting several bodily functions simultaneously. But they can also be specific, as when the iridescent jewel wasp encounters a cockroach several times its size that will become a living larder for its offspring. The wasp sweeps down, initially aiming its stinging barb at the cockroach’s front legs injecting a short-acting, paralysing venom. This allows her to deliver a further dose, with great accuracy, directly into that part of the cockroach’s brain that controls its behaviour, depriving it of the will to escape. By now, the first paralysing jab begins to wear off, permitting the wasp to take hold of the cockroach’s antenna and lead it ‘like a dog on a leash’ to a hole in the ground, lay an egg on its abdomen and inter it behind a wall of pebbles. Several days later, when the egg hatches, the larvae burrow into the still-living cockroach, feeding off its internal organs and juices, leaving the vital organs of heart and lungs until last. The mechanism of the jewel wasp’s mind-altering venom remained a mystery until a decade ago. That was when an Israeli scientist, Frederic Libersat, demonstrated convincingly that it blocked the action of a neurotransmitter, octopamine, which plays a major role in learning and memory throughout the insect world. As to how the wasp came to subvert it so ingeniously to its own nefarious ends, no one can say.